Sharp Tree Service offers land grading services to get your yard ready for swimming pool installation. We can get your yard ready for a new pool! Summer is still here and it’s still hot, hot, hot! So, maybe you’re thinking about installing a new above-ground pool? Great! You probably already know that installing a new pool requires level ground. Most yards, however flat they may appear, are going to require some amount of leveling in order to be pool-ready. Fortunately, we here at Sharp Tree Service have all the tools necessary to get your yard ready for swimming pool installation. We have our own skid-steer loaders for leveling ground, as well as our own bucket truck. If the job is big enough, we can even bring in a crane! 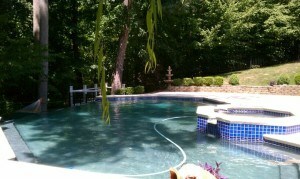 So, if you’re looking to install a pool this summer, then let Sharp Tree Service grade your land. Or perhaps you’d be interested in one of the many other hardscaping services that we offer? These, and all other services, can be found at sharptreeservice.com. Once we’ve got your ground level, you’ll be able to install that above ground pool. Then you can just keep swimming and have a great summer!